Today I sat down with Maria Carrillo ’07 grad at one of her favorite Boulder coffee shops, OZO Coffee. 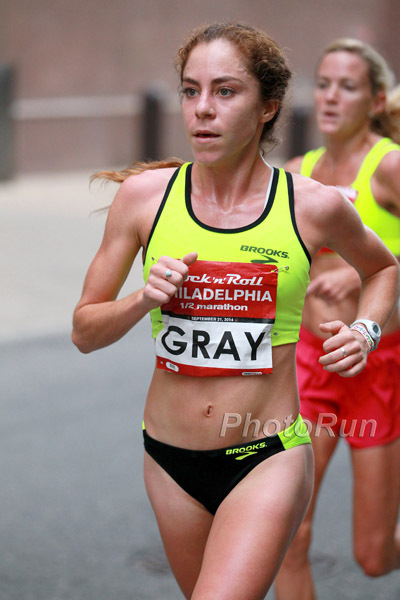 Despite not starting her competitive running career until well into HS, Gray has worked her way up to the top of all-time Empire lists. 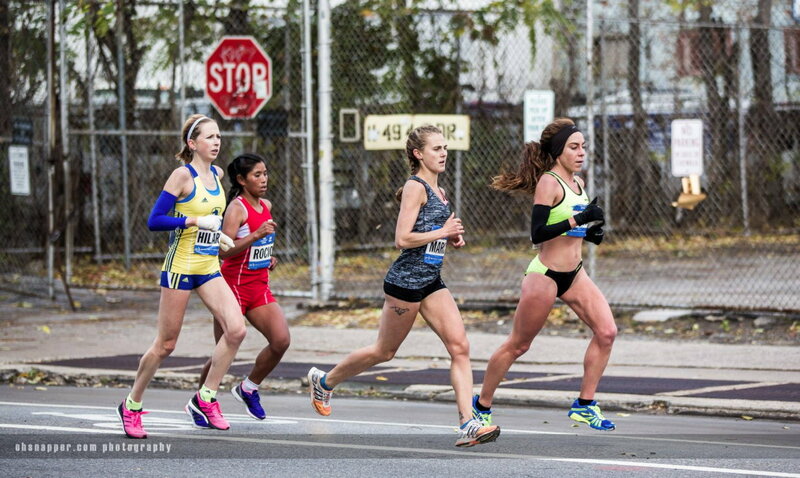 She’s currently the Empire Record-Holder in the marathon, thanks to a 2:39:43 at NYCM, where she was 16th overall and 5th American. 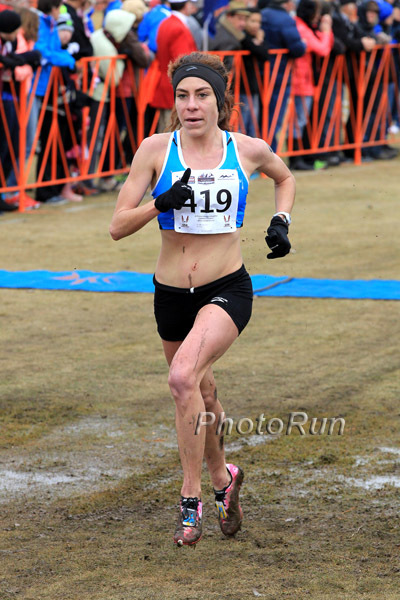 Other PR’s include 15:35.86 for 5,000m, 32:57.85 for 10,000m, and 1:13:34 for the half marathon, and she has placed in the top-10 at USATF National Championships for Cross Country, the Half Marathon, and 10,000m. Thanks for taking the time out of your busy schedule Alia! While you’re one of the top women in Empire history, many reading this may not know about you as you weren’t a prep super-star. Can you tell us a bit about that HS career of yours? I ran cross country my junior and senior year, and only ran track my senior year. I got a stress fracture in what would have been my junior year. I think I got a stress fracture because I got really excited about the sport, but I had next to no lifetime miles on me. Maria Carrillo High School team photo. Before I started running, I was a soccer player. I had a couple knee surgeries, and I started running because my friend Michaela Baer, encouraged me to come to some runs. I just loved the people and wanted to be around the people. I joke around that I joined the team because I wanted to go to the team pasta feeds. It’s partially true and food is a big part of my life! But I liked the people and as many runners know the running community can be such a positive place in spite of being so directly competitive that as a highschooler it’s partially a social decision. While it may have started as a social event, you did become a very successful, competitive runner. How’d that change come about? I think I got really lucky having people like [coaches] Danny [Aldridge] and Greg [Fogg] and Richard Flores around early in my running career. I didn’t realize at the time how knowledgeable they were. They were all so encouraging, but they weren’t pushy, which is a big thing with young athletes. They know that the athlete has to love it first. They were there to give me the work when I wanted to do it. I remember Danny a couple times telling me I could be good. I got into it because of the people, but I ended up loving it and wanted to be really good at it. I remember Danny telling me after one race I was in a lot of pain and on the verge of tears and he’s just laughing and he’s just like “oh my god you don’t know how good you can be”. I didn’t realize it at the time, but looking back you realize how valuable it is having people who can see things you couldn’t yet see for yourself. And you certainly got good at Chico while under the tutelage of Gary Towne. 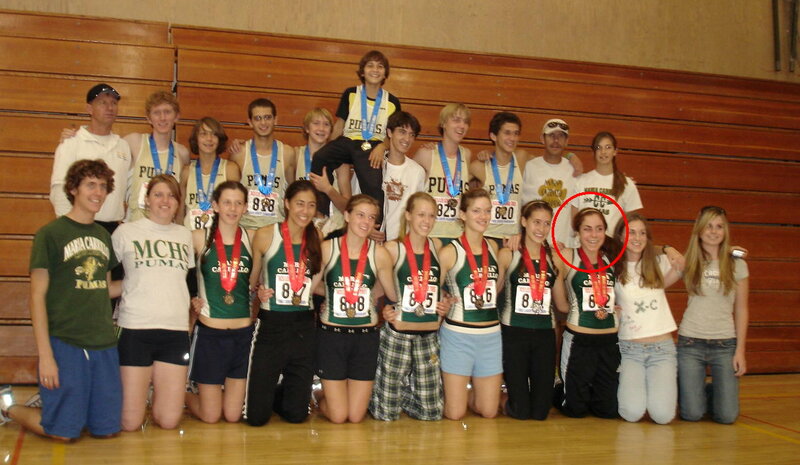 How did you end up a Wildcat, and how did that influence your trajectory as a runner? I knew I wanted to keep running and that I had a lot of development to do, but I was hesitant to go D1 because it could chew me up and spit me out. Greg [Fogg] brought up Chico, and mentioned something about me to Gary. What stuck out to me about Gary was that we talked for over an hour in our first conversation. The time that he took with me was just so valuable, especially knowing I wasn’t a big deal. That gave me a lot of faith that he had built something that was a good place to grow. 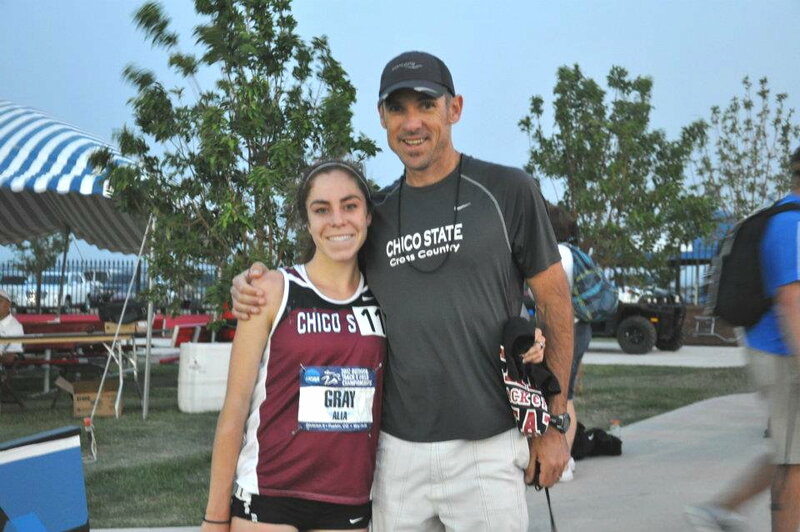 With coach Gary Towne after her last collegiate Outdoor Track Championships in Pueblo, CO.
Gary knows how to develop runners, and his ability to give so many kids individual attention, I have no idea how he does it. Each of us would sit down at the beginning of the season to lay out mileage, races, etc, and then do a meeting at the end of the season too. I was always looking forward to those; that was the equivalent of going to a teachers office hours. Getting that one on one time with the coach was really valuable and having someone in your life who could foresee things that you’d want to see but don’t have the courage to see quite yet. I remember him telling me “I think you can run sub 17 in the 5k” and at that time in my head that was like a huge, huge deal, and now I look back and like, of course I could! Goodness! Even from a young age, before I was ready for the marathon distance, he said I think you can be a really good marathoner. He was great at developing athletes throughout the collegiate career but he obviously loves running and that naturally becomes instilled in a lot of his athletes. He has you thinking about running not just as a college athlete but as a person as your lifelong love. And a lifelong love it’s become. After bouncing around a bit, you’ve now found yourself in Boulder running for Brooks, coached by the legendary Joe Vigil. How’s that new relationship been working out? The first couple weeks I had to get over being a bit star-struck to be honest. He notoriously prescribes really difficult work, and I’m notoriously my harshest critic. What’s been really great working with him is that he’s the first one to lift me up after a hard session. But, he’s not one to hold your hand; he’s not going to give you work to make you feel good about yourself. But he’s very uplifting and he loves his runners and he knows that them being excited is a big part of the work. He constantly reminds me that I’m still a work in progress. He tells me “you’re just a puppy,” at 26 years old! He reminds me that this is something that I’ll be doing my whole life. 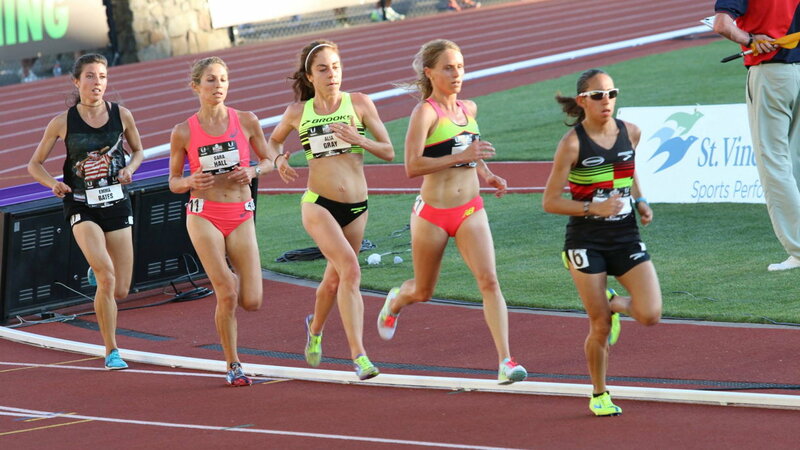 2015 US Outdoor 10K Championships. Great though Vigil may be, he doesn’t live in Boulder, so you’re being coached day-to-day by someone else. While many may know Richey Hansen as a great chiropractor, you not only know him as a coach but also as your boyfriend. How’s that whole combo-relationship working out? He deals with wearing many hats really well. He’s been able to be that in-person coaching influence as well as the emotional support. Not easy to balance! Lots of coaches may be happier if it was just black and white and numbers and that was that, but Richey manages me on the emotional side of running, which can be one of the more frustrating and challenging things in the world of running. He’s kinda there to tell me when something should be better when I don’t want to hear it and I’m hurting and ¾ into a workout and I’m slipping and need someone to get me back on it. Not an easy position for someone with that sort of emotional tie to do. He’s also the first one to build me up when I do something really worthwhile and the first to build my confidence. It’s just been an incredibly positive experience. It’s amazing, I used to say I’d never date a runner, that I wanted those lives totally separate, but I’m surprised the impact of someone so close to you and someone so incredibly supportive can have. I wouldn’t be able to do what I do without the way that we work together. Well I’m excited to see where that partnership continues to take you! So tell us, what’s on tap for the rest of 2015 into 2016? It’s gonna be so busy. 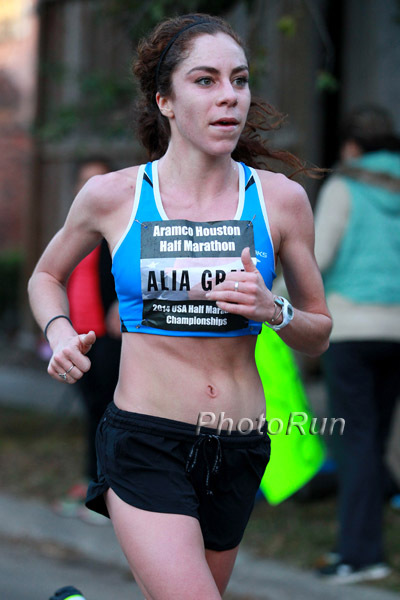 I’m really excited but I’m at a point where I took some time off after USA’s [Alia finished 10th in the 10,000m and 12th in the 5,000m), starting back at Minneapolis for the USA 10mi Champs, and there’s gonna be a fall racing campaign. The Olympic Trials are in February in LA; that’s the big one. It’ll be my first time at the Olympic Trials, which is really exciting. And then I’ll turn my attention to track and try to knock out some qualifiers for the track Trials, and hopefully compete in some track Olympic Trials at the end of July. It’ll be a fast moving next 9 months. But it won’t lack excitement! And if all that excitement isn’t enough, you work quite a bit outside your running. Why not just stick with training? Everyone finds a different way to piece together life and running. I’m really proud that I still work and that I’m pursuing a freelance career. In some way pursuing a freelance career is like trying to start a small business, which has its ups and downs, absolutely. I’m proud of the hard work I do running, but I’m also proud of my steps forward as a professional while pursuing running too. I think my dream situation is to have a sponsorship to do with running that would allow me to only pick up work that I really want to do. I do enjoy having work and that does help keep me a little more sane. So with this well-balanced life you’ve found yourself in, what should we expect from Alia Gray the runner in the future? As cliché as it sounds, I just want to be the best that I can be. I think I’ve kinda been surprised by how much I loved running. The last time I was home my mom kinda jokingly looked at me and said “will you just admit you’re a runner already?! I feel that you spend so much time pretending that you’re something else.” It’s fun to embrace it a bit more. I don’t have an end goal in sight, and my goals keep changing and growing bigger as I get more mature in the sport. I don’t know what my cap is, but I know when I’m working hard and when I’m doing all that I can with my capabilities to be the best runner I can be. Any last thoughts or advice for the next generation of runners reading this today? I would just tell them that if they love it, there’s always a way. Not to be super cliché and cheesy, but that’s gotta be at the heart of it. You really have to love it and different challenges come up in the pursuit of that; in college it’s classes, and maybe social life sometimes. For me running is what I always came back to. If I was stressed out running is what made me feel better. A lot of the most positive, influential people have been those that have supported me throughout running.